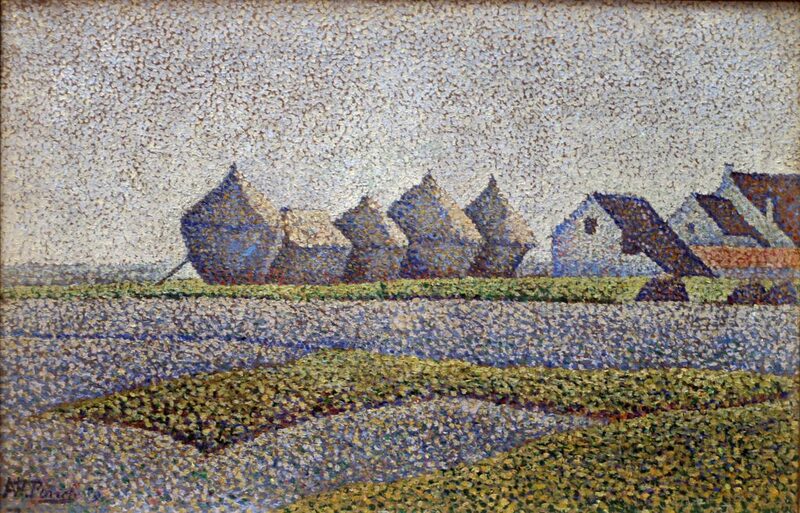 The repeated, almost abstract outlines, of haystacks and neighbouring farm buildings are the only relief from the oppressive flatness of the landscape. Finch’s restricted palette of grey-blue, light blue and green with darker blues and reds used only for shadows and details in the buildings, seems to emphasises the monotony of the landscape as does the artist’s decision to split the composition in half horizontally. This reductionism chimes with Seurat’s ‘Marines’ and indeed a more general proclivity among the Neo-Impressionists for stripping away all extraneous detail in their landscapes. Here, then Finch concentrates our attention on the central motif – the Haystacks and their attendant farm buildings – set amid the uninterrupted levels of the Lowlands.